The transition from summer to autumn is one I look forward to. I always have done. Much of this is because my birthday is in early October, so from then until the new year, it’s party season. Another reason is because it feels like a fresh start. A grown-up version of going back to school with a pristine uniform and a pencil case full of coloured pens. (I loved school). This autumn feels even more like a new start. Since making the decision to leave my day job, I’ll need to devote every working, (rather than every waking), hour to my blog, my freelance writing and my online jewellery business, (which has beenwoefully neglected of late), to maintain my income. Along with this new focus comes a desire to devote a little more time to my wellbeing. Here are a few products, a cornucopia of loveliness. that are already making a difference. The golden tan I returned with after my summer holiday has all but faded. 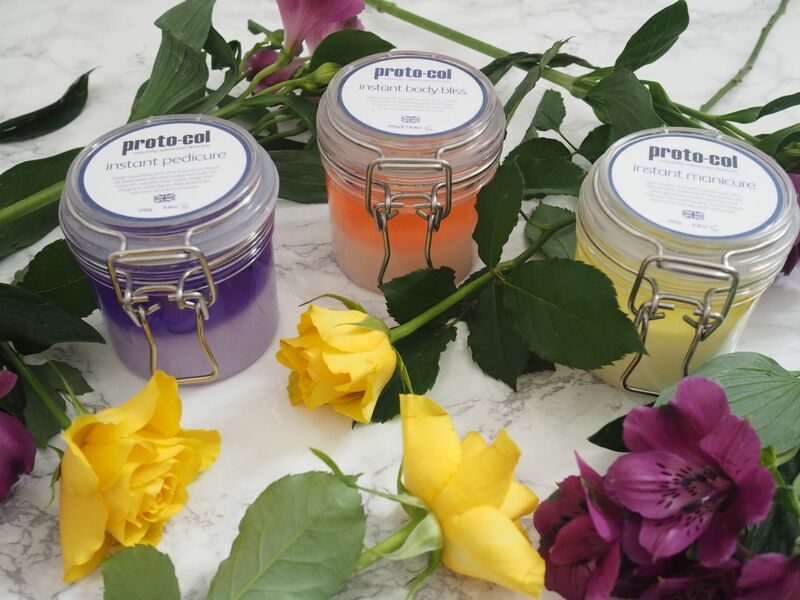 In an effort to smooth and condition my skin, I’ve been using *Instant Body Bliss, Instant Manicure and Instant Pedicure, (£19.95 each from Proto-Col). Each is a blend of Dead Sea salt and essential oils. Not only do they work brilliantly at exfoliating and moisturising, they have awesome shelf-appeal too. I’ll be honest, it’s slightly messy when getting the product out of the jar, but all three are excellent. They leave my hands, feet and body beautifully scented and noticeably smoother. I highly recommend them. Collagen is hugely important in the function and appearance of the skin and I believe in feeding the skin from the inside. I’ve been taking a collagen supplement for a month now, (*hydrolised collagen high strength 1000mg £7.99 for 60 tablets, Evolution Slimming). It’s difficult to measure the difference and I think it will be more noticeable after a longer period, but I’m certain it must have had a positive effect. 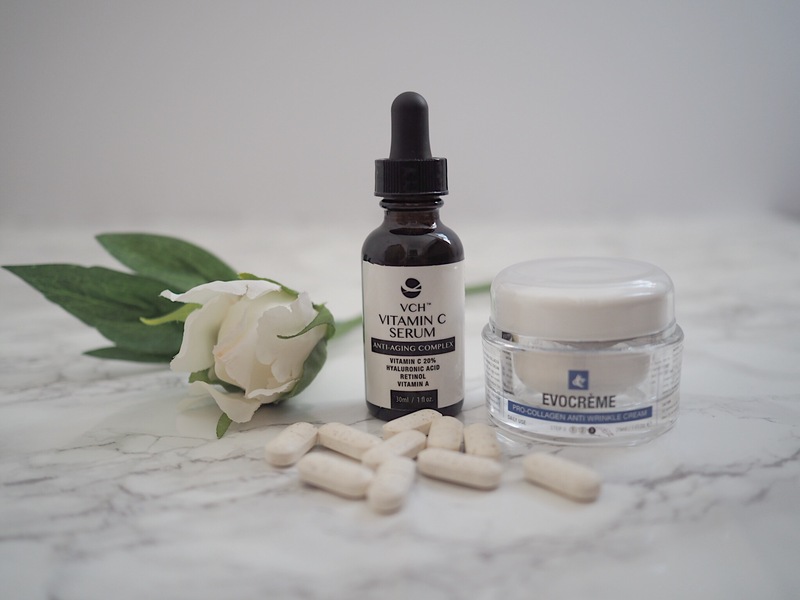 I’ve also been using some new skincare products for a few weeks: *Evocrème, Pro-Collagen Anti-Wrinkle Cream, £29.99 and *Vitamin C Serum, £31.99, (both from Evolution Slimming). The serum is a clear light gel in a dropper bottle so it’s easy to dispense. It contains renowned anti-ageing ingredients hyaluronic acid, retinol plus vitamins A and C. The Evocrème cream feels gentle on the skin and has a smooth cream consistency. Both products are lovely to use and they sink in quickly, so are suitable for both day and night. 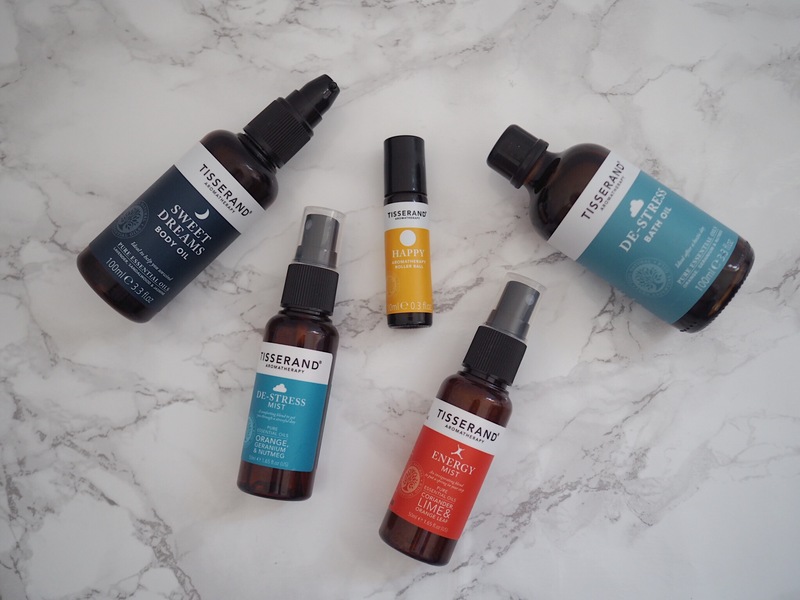 It’s difficult to measure results after only a few weeks, but without doubt, my skin feels very soft and plump with none of the tightness or discomfort that some serums impart. I’ve always loved scented candles and usually choose a fragrance to relax and soothe. However, I have been burning this *Lime and Ginger Scented Candle, (£11.99 Daisy Blue) throughout the day while I work and it’s fabulous. 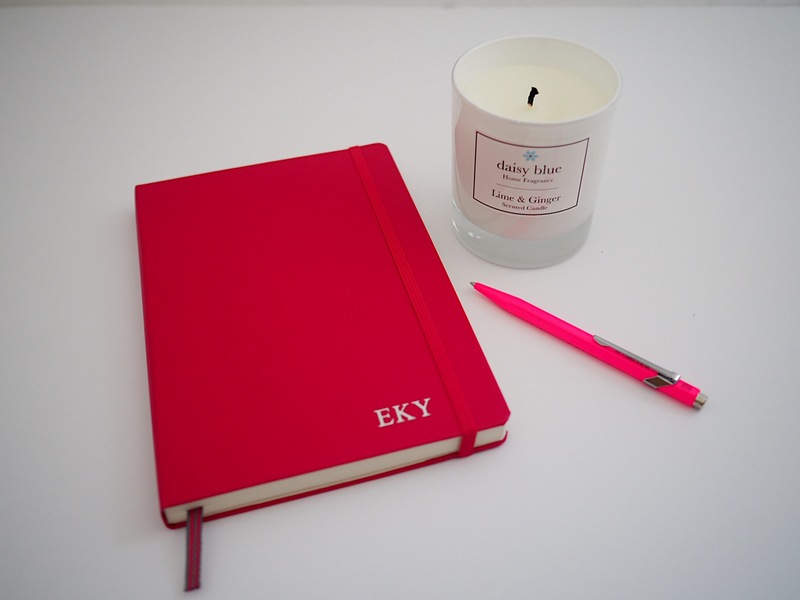 It has a delicate, uplifting, energising scent and it makes my desk a very pleasant place to be. The “back to school” excitement I mentioned earlier has never left me. This *embossed Leuchtturm pink leather notebook and amazing Caran D’Ache *pink pen (It’s a ballpoint pen that doesn’t blot and is so smooth to use), makes planning my days feel rather more special. Ian’s coming this evening, so we’re going out for dinner. I’ve got a new outfit which I can’t wait to wear so I’ll get it photographed and post it here next week (I’ll try to put something on Instagram stories before then though). Most of Saturday and some of Sunday will be taken up with football. On Monday evening I’m staying with Lisa, The Sequinist at her London home, because on Tuesday, I’m travelling on to Axminster. I’ve been invited to River Cottage by the team at Muck Boots for a cookery day and a hotel stay. To say I’m excited about the next few days is the understatement of the season! Later this week I’ll be linking this post to I Will Wear What I Like, Brilliant Blog Posts and The Saturday Share. Thank you for reading and for supporting the brands that support What Lizzy Loves. Thanks to your recommendation I made a purchase from Daisy Blue and I have been burning the Plum and Rhubarb candle this weekend. It’s got a gorgeous scent and I am really impressed with the quality of both the candle and the glass and the website is really informative. I dabble in essential oils at home so I try to find room fragrances which I can’t create myself and these are definitely a bit different. I bought a wonderful scented candle from Tisserand as part of their RHS collection but they’ve stopped producing them so I’m really pleased to find an excellent alternative – another great find Lizzy!